For those of you that do not mind paying a little more, and for those of you that want cheap stuff, it is all on this page. I have what I call skins - which glue on card or foam. Also I have modular pieces of solid resin, and all will go to you un-painted. This is a resin house for 25mm or 30mm models. The back wall has only one window. All sides have wood design sculpted in. Thatch roof kit available for house. Seam sculpting required for assembly. Here is a Resin Bridge made of 5 parts. The double arch is almost like a m.
Here is a rock wall with a window. Also one with a doorway and pillars. Notice the torch with the flame cut off? It can be for almost any time or culture. All you have to do is finish it out to match. It comes with 4 sides and rafters for a card roof. Also 1 door with pins for a working door. I will need details from you if you want window ends. Measures 2" high x 2-1/2" wide x 4-1/4" long. (without rafters) rafters add 1" to the height. Well after much practice, and looking through some history books, here is a thatch roof that will work for many models. This consists of 2 roof logs, and many pieces of the same mold. Depending on size of model. This requires some sculpting to hide seams. 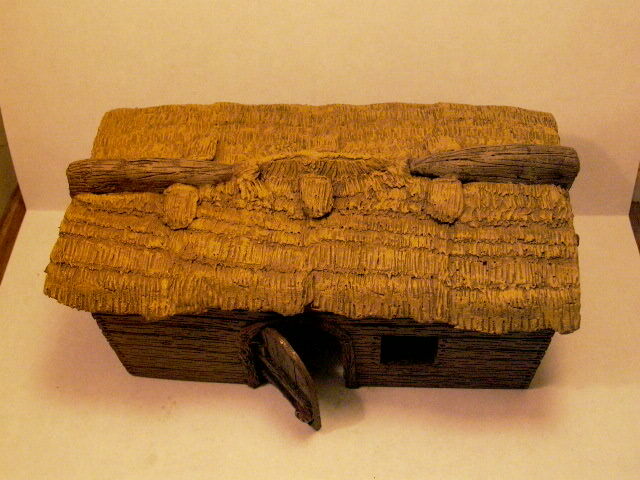 I used 8 thatch panels glued togeather with the log sculpts. Also included is the braces to glue under the ends to look like rafters. The planks make a wide path to cross a river. Most wagons and war machines will fit easily. It may not look like much to those of you who do not sculpt. Just let me say," I will not be making many of these." It took a long time to get it done. It was a pain, but now all you have to do is buy it and paint it. Measurements are 2 3/8" tall x 4" long x 3/16 thick. Window is 1" up the wall. The wall with the doorway is almost the same size. The doorway is larger than most of my doorways, and I am going to make a door to go with it. The third rock wall is just a wall. Nothing on it at all just a bunch of sculpted rocks. One after another row after row of tiny little details. I do not like rock walls anymore. Just keep checking in on this page if you are interested in it. I am going to do one more building soon. Till then take a look at the sample uses below. A nice view of the wall with the window. Plus see the skull pot outside, and mushrooms? The wizard is a Warhammer 30mm character used for scale. I made ends with windows & without. So you can make each one unique. Before you buy this kit, please read.You will have to have knowledge of sculpting to blend the seams. Use kneaditite along all seams and sculpt to match thatch. This picture shows the end result of a model consisting of 18 pieces plus sculpted putty that has been painted. It will be in 18 pieces and white resin. Just take a look below at some sample pictures. You can build almost any building with this. I did a old guard shack with a huge hole in one wall. If you look close some chair parts can be seen by the wizard. Click on any photo to blow it up. Also a view of a wall section in ruin. Just snip it with wire cutters, and you have a broken wall.